Kodak Alaris is expanding its information capture ecosystem, delivering on the promise of digital transformation for businesses and governments around the world. The global solution provider is hosting customer and partner events in all regions this week to unveil the Alaris S2000 Series – a new family of network/wireless and USB-connected desktop scanners – and showcase its award-winning software and services, all of which are designed to take the complexity out of information capture to simplify and improve the way people work. The new Alaris S2000 Series increases productivity by automating much of the work traditionally done by people and host computers. Embedded Image Processing within the scanner delivers crisp, clear images without requiring a high-powered (or expensive) host PC. Breakthrough Active Feed Technology aligns the leading edge of paper to avoid multi-feeds and misfeeds, and Controlled Output Stacking places paper neatly in the output tray. Users benefit from spending less time preparing documents for scanning and dealing with messy output stacks. The S2000 Series includes two USB-connected models (Alaris S2050 and S2070) and two network/wireless models (Alaris S2060w and S2080w)) which deliver rated speeds between 50 and 80 pages per minute (ppm). Each scanner is compact, powerful, and easy to use with a robust feeding system that efficiently handles a wide range of media. Three optional flatbed accessories can be integrated with the scanners for increased versatility and productivity. For example, the S2000 Series is designed to ‘dock’ on top of the new Alaris Passport Flatbed Accessory, offering a quick and easy solution for scanning passports, ID cards and other small, fragile documents. Today’s complex data environment requires an integrated approach to information capture that includes industry leading scanners, software, services, and a global network of trusted partners. Partner and developer communities play a vital role in the IN2 Ecosystem through their ability to connect, configure and create new solutions that meet customer needs. The newly launched Alaris Partner Program is designed to enable channel partners to grow their businesses by offering best-in-class technology and sophisticated solutions and services. It includes a new partner portal, sales tools, incentives and technical resources designed to help partners win in the marketplace. A new generation of software from Kodak Alaris offers flexible and powerful batch capture for a wide range of industries and vertical markets, and is particularly effective for BPOs and centralised mailrooms. Alaris Capture Pro Software v5.5 is a dedicated workstation-based information capture solution that ensures security and reliability without depending on internet connectivity for scanning and processing. It seamlessly delivers information to databases and applications, including Enterprise Content Management (ECM) systems and Microsoft SharePoint Online (Office 365). For example, one scanning service bureau is using Capture Pro’s advanced indexing capabilities to increase productivity and reduce data entry times by 50%. Capture Pro Software is also ideal for high-performance distributed scanning environments and has been optimised to work seamlessly with the new S2000 Series Scanners. Alaris Info Input Solution and Info Input Express are web-based and mobile capture applications that are easy to implement and use for workers who regularly scan across departments and enterprises. 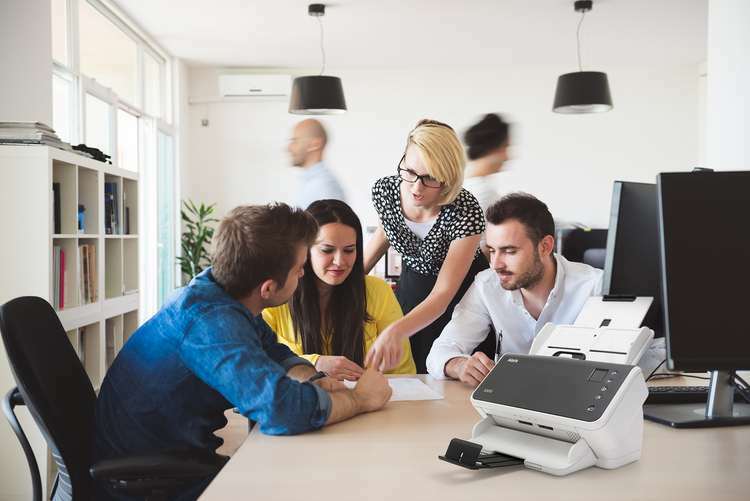 Info Input Solution and Express enable effortless information capture from scanners, smart devices (via mobile app), and digital files (including email) from one application. Info Input Express Limited Edition is bundled with every S2000 Series Scanner. In addition to expert Repair and Maintenance Services to optimise uptime and productivity and Professional Services to deliver in-depth advice, subject matter expertise and value, the IN2 ecosystem now offers Managed Content Services (MCS) in select regions. By developing an MCS partnership with Alaris, customers gain a team of industry experts that help maximise the efficiency and power of their total capture environment. MCS helps organisations by providing a better understanding of total imaging costs, improving service level agreements (SLAs), and driving sustainable savings. For example, the UK operations of an international bank used Alaris Managed Content Services to re-engineer its document management processes. As a result, they replaced outdated equipment, reduced the number of scanning workflow processes by 90%, and dramatically reduced TCO, all while increasing productivity significantly. For more information about the Alaris IN2 Ecosystem, please visit the Kodak Alaris website. To request a demo of the Alaris S2000 Series Scanner, please click here. [i] IDC White Paper, sponsored by Kodak Alaris, Information Capture: Cornerstone of Digital Transformation, July 31, 2017.